Like the tomato, chayote squash is actually a fruit that is used as a vegetable. Pronounced "chi-OH-tay," it is small and pale green, resembling a large pear. In fact, it is also called vegetable pear, alligator pear and mango squash. 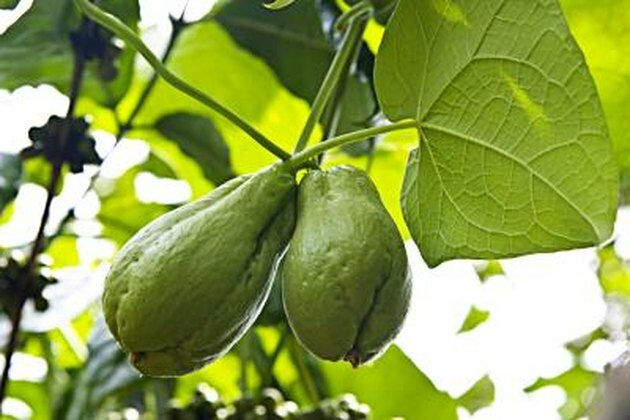 Chayote is a popular ingredient in a variety of Mexican, Indian and Latin American dishes. Related to the cucumber and zucchini, chayote has a mild, somewhat sweet flavor. In season from September to May, you can find chayote in some supermarkets year-round. Chayote is low in calories and chock-full of vitamins and other nutrients. Chayote squash, or Sechium edule, makes a low-calorie side dish, having 11 calories in a one-half cup serving. A one-half cup serving of chayote squash contains 1 g of protein and 5 g of carbohydrates, with 2 g sugar. Chayote squash has no cholesterol or fat. Chayote is also extremely low in sodium, having only 3 mg in one-half cup. Chayote squash adds a bit of fiber to your diet. A one-half cup serving of chayote squash contains 2 g of dietary fiber. The fiber is your diet comes from the parts of plant-based foods that aren't digested. Soluble fiber from beans and oats appears to lower cholesterol levels, as well as help keep blood glucose levels stable. Insoluble fiber, from whole grains and many vegetables such as chayote squash, adds bulk to the stool, which keeps waste material moving through your digestive tract to prevent constipation. The Institute of Medicine recommends that women consume 25 grams of fiber a day and men consume 38 grams. Several important vitamins and other nutrients can be found in chayote squash. One half-cup serving provides 17 percent of your vitamin C needs. Chayote squash also contains B complex vitamins, including 61 mcg folate and small amounts of niacin, thiamin, riboflavin, pantothenic acid and vitamin B6 in a half-cup, according to the U.S. Department of Agriculture. The B vitamins play important roles in metabolism. Chayote squash might also provide some health benefits in addition to providing beneficial nutrients. Purdue University says an herbal tea made with chayote squash leaves is used for lowering high blood pressure, dissolving kidney stones and treating atherosclerosis, or hardening of the arteries. A tea containing the flesh of chayote squash has mild diuretic properties and is used for treating bloating in some parts of the world.